by Rob - December 19th, 2014. 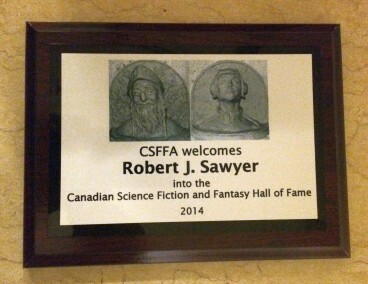 I realized today that I hadn’t noted yet here in my blog one of the biggest honours of my career: On Saturday, October 5, 2014, I was one of the initial inductees into The Canadian Science Fiction and Fantasy Hall of Fame, administered by The Canadian Science Fiction and Fantasy Association — the same people responsible for Canada’s venerable Aurora Awards. The guidelines for being inducted are here. I’m deeply honoured and moved. Thank you. Dennis Mullin and Susan Wood are prominent Canadian fans; the others are all authors. Phyllis Gotlieb, Judith Merril, Jeanne Robinson, Susan Wood, and A.E. van Vogt were inducted posthumously. The induction took place at VCON 39, this year’s Canadian National Science Fiction Convention (or “CanVention”), held in Vancouver; William Gibson, Spider Robinson, and I all made it to the convention to receive our induction plaques.